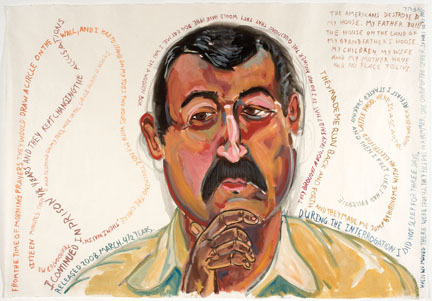 Visiting Associate Professor of Studio Art Daniel Heyman spent four years traveling through Jordan and Turkey, speaking with former Iraqi detainees who had been subjected to torture at the Abu Ghraib prison, recording their statements, and portraying their faces and their words in a series of paintings. Another series of portraits by Heyman shows African American men from the Philadelphia area who have suffered extreme poverty and/or incarceration. This spring, Heyman’s art and curatorial vision provided the impetus for a five-week series of events organized by the College’s List Gallery and McCabe Library—two exhibitions, a symposium, and a poetry reading—that highlighted the role of contemporary artists who address global warfare, related health issues, and other crises of politics, critiquing institutionalized violence by their various uses of imaginative space for compassionate endeavors. Besides his List Gallery exhibition Bearing Witness: Recent Portraits by Daniel Heyman, his work was also displayed in Printmakers Go to War: Works by Daniel Heyman in Collaboration with Nick Flynn, Damian Cote, Eric Avery, Ehren Tool, and Michael Reed in McCabe Library. The symposium “Artists in Wartime: Bearing Witness / Shaping a Response,” moderated by Assistant Professor of Art History Janine Milieaf, provided a forum for discussion among artists including Heyman, Cote, artist and historian Melissa Ho, documentary photographer Andrew Lichtenstein, and artist Juan Manuel Echavarria.